OWoN: This is a never ending and growing deluge. They all need to be sent right back. It's crippling nations. This is a vast new Welfare pack of vultures, no education, sick, diseased, multi breeders, and God knows how many ISIS among them. Boats need to be turned back and crippled fast once seen leaving land loaded. Tow them to shallow waters and sink the boats. Its a growing nightmare. Man the borders, defend all as invaders. 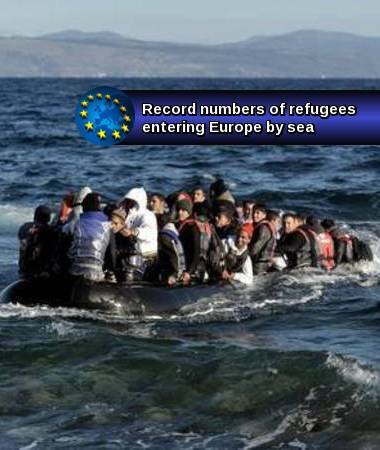 The EU is drowning under them and the tide is growing. Yes to Austria arming, sorry but a 9mm is one dollar and cheaper than millions on welfare collapsing everything. Letting them in is like feeding a pack of skip rats outside your home. You know what comes next. Refugees and migrants arrive on the Greek Lesbos island after crossing the Aegean Sea from Turkey on Nov. 2, 2015. The number of migrants and refugees entering Europe by sea last month was roughly the same as that for the whole of 2014, United Nations refugee agency UNHCR said on Monday. The massive influx, despite cooling weather and choppy waters, highlights the strains that European policy-makers and authorities have been under with the unprecedented flood of people fleeing countries including Syria, Iraq and Afghanistan through Turkey to Greece this year. The office of the United Nations High Commissioner for Refugees estimates that more than 600,000 people have now crossed the Mediterranean this year. 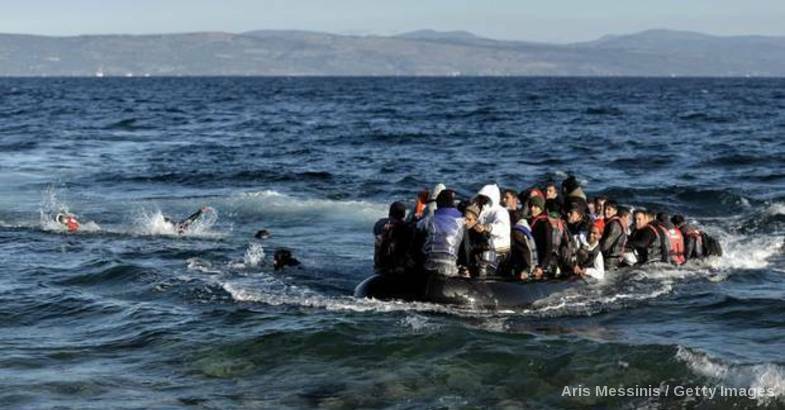 At the peak, 10,006 arrived on Greece’s shores during a single day, Oct. 20. The vast majority of refugees and migrants to Europe have travelled via Turkey to Greece, a switch from the previously more popular African route via Libya to Italy. The largest group by nationality are Syrians, accounting for 53 per cent of arrivals, as a result of the civil war that has driven hundreds of thousands from their homes. Afghans come second, making up 18 per cent of the total. The flow of refugees into Europe, however, is still dwarfed by the numbers in Syria’s neighbours. Turkey, Lebanon and Jordan have Syrian refugee numbers exceeding two million, one million and 600,000 respectively. The October figure was “beyond anything that could have been expected even a few months ago,” Mr. Edwards said. He noted a decline over the past few days, but cautioned it was too early to determine if that amounted to a trend. “We hope that there will be some reductions in the number of people crossing this year, simply to help with the manageability of the situation, but unfortunately, the underlying causes that are making people move across the Mediterranean to Europe are still there,” Mr. Edwards said. Four people were rescued. Eleven people, including six infants, drowned on Sunday when their boat capsized off the island of Samos, trapping them in the cabin. There were near-gale-force winds blowing in the Aegean Sea on the weekend. From the start of the year until Oct. 29, at least 435 people had drowned in the Aegean trying to reach Greece, according to data from the International Organization for Migration, an intergovernmental body. Greece has agreed to temporarily house up to 50,000 refugees on its territory this year, with many in temporary housing subsidized by the United Nations. The first relocation of a group of 30 asylum seekers from Greece to Luxembourg, which presently holds the rotating EU presidency, will take place on Nov. 4, the Greek Interior Ministry said on Monday. The migrants are from Syria and Iraq. “It is a symbolic move designed to urge and encourage European governments to show active interest in receiving refugees,” the ministry said. As well as Luxembourg, Belgium, France, Germany, Cyprus, Lithuania and Finland have also shown an interest in the relocation program, the Greek ministry added. EU countries are “moving slowly at a time when they should be running,” European Commission President Jean-Claude Juncker recently told lawmakers. The arrival of more than 740,000 people this year is ratcheting up tensions. Many EU countries are blaming Germany – the preferred home of many seeking sanctuary or jobs in Europe – for encouraging the masses to continue making the perilous journey. Increasingly cold weather is a new enemy, as the EU and member states race to set up shelters along thousands of kilometres of the “migrant route” out of Greece northwest to Austria. Whomever has funded and organised this invasion, for that is what it is, is waging war against Europe. Nikolai Starikov, a Russian writer and geo-political analyst, gives his opinion about what Europe must do to defend itself. He agrees with John that all illegal immigrants should be sent back as quickly as possible. "Look at the logic - it is completely absent, because the media veil closes people's eyes"